Sepphoris Dig Update - CenturyOne Foundation, Inc. Although the dig has again been callcelled in Sepphoris, the Directors expect to be in Israel working on the publication of materials from earlier seasons of excavation. It is unlikely that we will be able to return to the field in 2004. We will update this site when we have the new schedule. 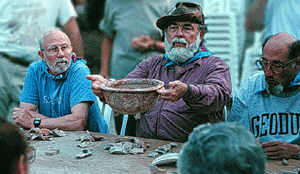 The 13th Season of the University of South Florida's Excavations at Sepphoris was completed in the summer of 2000. There were groups from the University of South Florida, Colby College, Wesleyan University, University of North Carolina at Charlotte and a group sponsored by Vision.org. Continuing from where they left off last year, additonal work was done on the large basilical building built at the beginning of the first century C.E. This building continued in use until the middle of the fourth century C.E. The excavations yielded surprising new evidence about the site. A coat of Roman armor – an iron cuirass – was found last year. In addition, a gold coin, whole pottery forms and largely intact glass vessels were recovered. New walls and foundations have raised more questions than they might have answered. Complete 2000 report to follow. The dig was again under the direction of Dr. James F. Strange of the University of South Florida in Tampa, Florida. Associate Directors are Thomas R.W. Longstaff, Crawford Family Professor of Religious Studies at Colby College in Waterville, Maine and Dennis E. Groh, Professor of Humanities and Archaeology and Chaplain at Wesleyan University in Bloomington, Illinois. The excavations at Sepphoris have added a lot to our understanding of what the region of Galilee was like during the first century. It was not, as once thought, the idyllic picture of a rural Galilee. To the contrary, Sepphoris represented a center of urbanization, commerce and government. The excavations have given us a better historical social context with which we can come to a fuller understanding not only of the Jesus movement, but also of Judaism and Jesus' contemporaries. Richard Horsley wrote in Archaeology, History and Society in Galilee, that "even if Sepphoris had not been located in such proximity to Nazareth, Jesus' home town, and even if Tiberias had not been situated directly across the lake from Capernaum, the headquarters of Jesus' ministry, these cities would still have had a major impact on the Galilee of Jesus' ministry and movement." Although the excavation team for the USF Excavations at Sepphoris is assembled from colleges, universities, and other institutions throughout the United States along with other volunteers, it is a costly expedition. More funding and volunteers would allow more work to be done each season. Your assistance with either facet of this significant project is greatly appreciated. ©2007 CenturyOne Foundation, Inc.– a Nonprofit Organization All Rights Reserved.